How Does Metal Detector Work? 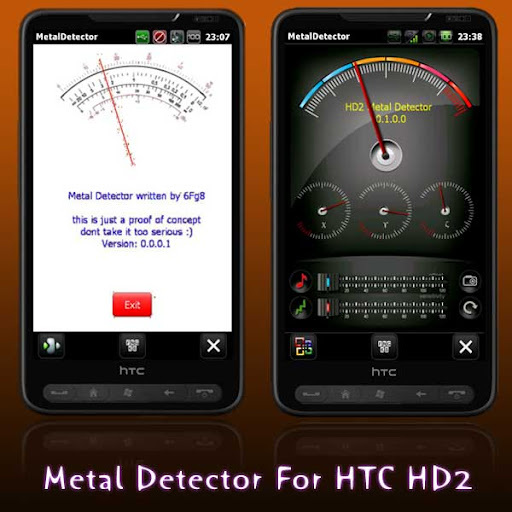 HTC HD2 has inbuilt compass ie magneto-inductive sensor, nowadays all smartphones have one. If you bring any metal object like nails, scissors, knife etc the compass will indicate the deviation, since the magnetic field changes due to the influence of these magnetic material ie metal. The app is based on the simple concept but tests revealed it to be powerful and accurate considerably. The author is consistently working on improving the algorithms. The new version has some eye candy because the skin is changed. If you have an HTC phone, play with this cool stuff. I am an optimist that Metal Detector app will support more Compass enabled phones soon. It's not just iPhone which has cool apps, Android is rising and we have to see tons of apps more. So friends what do you say? Did you like this App? I know you have something to say. I wish you could have an HTC phone, one of the best in world. I also don't have an HTC phone :(. @Shabnam i wish the same for you too. Really cool app.... i have HTC HD2 .. but its working on windows not android .. will this app work on my phone?